I can’t stand it. It seems like every TV channel and every newspaper and every political leader actually believe Global Warming is caused by human activity. This is truly incredible. Not since people believed that the Earth was flat and you could fall off the edge have so many been fooled into believing such misconceived garbage. In desperation, I’ve produced my own David Craig video debunking the Man-Made Global Warming hoax in just three simple pictures. 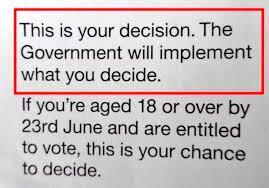 So, you have a choice. Do you believe a (IMHO) ghastly, precocious, attention-seeking, pig-ignorant schoolgirl (who looks like a member of the Adams family) and a (IMHO) revered national treasure who has suddenly turned into a senile, doddery old fool? Or do you believe my simple but straightforward explanation of the reasons for our climate changing? Extraordinary things are happening in both the UK and the US. And they are both very similar. The progressive, virtue-signalling, liberal elites in both countries are refusing to accept that they lost the argument in 2016 and are prepared to totally trash democracy and make their countries world-wide laughing stocks in order to overturn election results they didn’t like. Moreover, the Remainers ran a constant Project Fear campaign vomiting lie after lie after lie about the economic disaster and hundreds of thousands of lost jobs that would follow a vote to leave. The Remainers also enlisted Saint Obama to threaten us with dire trade consequences if we dared to disobey the orders of the ruling elites by voting to leave the corrupt, wasteful, undemocratic, globalist EU. 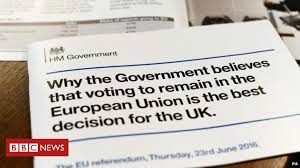 But it was all lies – the progressive, globalist, liberal elites never intended to let us leave the EU and have successfully waged a 3-year campaign to sabotage Brexit and keep us in the EU. Of course, you all know this. But what is perhaps more worrying is that we see an almost mirror image of this situation in the US. Again, let’s go back to 2016. The US presidential elections. Everyone assumed Clinton would win. After all, every single mainstream media in the US and abroad backed the Establishment candidate, Clinton, and she spent (I think) about 5 times more on her bid than Trump could manage. The Clintonites, naturally, chose to not mention the many millions poured into the Clintons’ already bulging bank accounts by the Gulf Arabs and what they expected in return for their generosity. They never mentioned that it was the Arabs, rather than the Russians, who actually interfered in the campaign. Then, just as in Britain, we had a massive 3-year campaign by the sore-loser (misleadingly named) ‘Democrats’ to overturn the result of the election. In the US this consisted of a witch hunt trying to establish that the Trump campaign colluded with the Russian Government to interfere in the presidential election. For 3 years the mainstream US media were howling “collusion, collusion, collusion” to try to overturn an election result they didn’t agree with. So what? Why have I just wasted several minutes of your lives with this? It’s because I believe we have entered a new era in politics. This is an era where Democracy is dead because the progressive, liberal, globalist, bureaucratic elites believe that only they know what is good for us deplorable, bigoted, narrow-minded, racist ordinary people. Therefore they are convinced they have the right to ignore and/or overturn the results of any elections that don’t go their way. Whether it’s about immigration, Izlumification, economics, globalisation, the environment or whatever, the progressive, globalist, libtard elites feel they can ignore the views of ordinary voters. That’s a very dangerous situation which could lead to a massive and possibly violent (as we see in France with the gilets jaunes protestors) backlash from those ordinary people the elites despise so much for their ‘wrong-thought’ and ‘wrong-votes’. 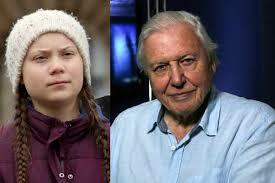 I admit I didn’t watch the whole of the BBC’s dreadfully misleading supposed documentary “Climate Change – the facts”. I just couldn’t stomach so much misleading BBC progressive woke propaganda. After all, during my youth I spent a bit of time in the Soviet Union and so saw enough garbage propaganda to last a lifetime. why didn’t the programme mention the effect on the Earth’s climate of variations in solar activity? why didn’t the programme mention the effect on the Earth’s climate from small deviations in its orbit? why did the programme not mention that CO2 is a vital element in ensuring plant growth such that many farmers growing food in greenhouses actually use CO2 generators to increase the amount of CO2 to improve plant growth? why didn’t the programme mention the fact that a warming climate causes the oceans to release more CO2? So, increasing CO2 may be the result of warming rather than its cause? why was a programme supposedly giving us the ‘facts’ spending so much time featuring protesting schoolchildren whose grasp of complex multiple-factor feedback systems like the Earth’s climate would be more than questionable? But I’ll leave a full criticism of the trashy Soviet-style propaganda programme to people with a better understanding of climate science than myself. The most misleading chart ever produced? But why did the programme choose a chart that started in 1850? Why not 1750? Or 1650? Or 1900? Or even thousands of years ago? After all, there are been plenty of scientific studies using ice cores and other methods to estimate the Earth’s temperature changes over longer periods. The well-worn 1850s chart is wonderful for the Warmies as it shows the Earth’s climate becoming increasingly warm as industrialisation gathers pace and spreads around the world. There you have it folks! It’s clear from the chart that the Earth’s warming climate must be due to industrialisation and the increasing CO2 emissions caused by industrialisation and the use of fossil fuels. So, the science is settled (claims Sir David). Looking at this chart, we can see the Earth has clear warming and cooling cycles. 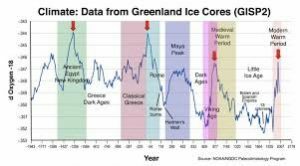 Looking at this chart we can see that we are moving out of what has been called the ‘Little Ice Age’ and into what has been called the ‘Modern Warm Period‘. Looking at this chart we can see that current temperatures are NOT exceptional, but are actually below previous peaks. Looking at this longer-term chart, we can see how misleading the 1850s chart is. This one also suggests we are moving out of the ‘Little Ice Age’. The ‘Little Ice Age’ lasted from around 1300 to around 1870. Yippeee! By choosing a chart which conveniently starts in 1850 – at around the end of the ‘Little Ice Age’ – the Warmies can ‘conclusively prove’ that the Earth is definitely warming. is the warming due to human activity? No. The warming is part of a natural cycle in which we are now moving from a ‘Little Ice Age’ into the ‘Modern Warm Period’ and human activity probably has no effect at all on the long-term cycle of warming and cooling. That’s why the Warmies love the 1850 chart so much. It hides the truth and supposedly supports their Man-Made Global Warming hoax. The words “lying, data-manipulating scumbags” come to mind. But it’s not the figures that are lying – it’s the people using and abusing those figures! By carefully choosing a short period – 1850 to the present – the BBC Warmies deliberately give a completely misleading impression of what is actually happening to the Earth’s climate. Propaganda, deceit, lies! The BBC Warmies are at it yet again and again and again. As for Sir David’s participation in what I believe is a hoax – legal considerations prevent me expressing my true feelings. So, the venerable national treasure Sir David Attenborough was back on our screens last night predicting total catastrophe if we humans fail to act on Climate Change. He gave us all the usual warnings – “right now we are facing our greatest threat in thousands of years – climate change” and “there isn’t much time left” and “the science is clear that urgent action is needed” and of course “we are facing a man-made disaster on a global scale”. But these predictions of total climate catastrophe have a long and not very honourable history. So, according to this (IMHO) useless parasitic buffoon, by 2002 we should have been deep in climate doodoo. So, we should have seen this disaster scenario by 2002, about 17 years ago. I’m still waiting. By 2006 the situation was apparently becoming critical as Al Gore explained in his fantasy film “An Inconvenient Truth”. According to Gore we had just 10 years left to save the planet. In fact 2009 seems to have been a popular year for climate catastrophe predictions. UN Secretary-General Ban Ki-moon announced his own deadline in August 2009, when he warned of “incalculable” suffering without a UN climate deal in December 2009. But in 2012, the UN gave Planet Earth another four-year reprieve. UN Foundation president and former U.S. Senator Tim Wirth called Obama’s re-election the “last window of opportunity” to get it right on climate change. And we mustn’t forget top UK scientist Sir David King who warned in 2004 that that by 2100 Antarctica could be the only habitable continent. Like Charles, Sir David won’t be around in 2100 making his prediction extremely convenient for him and his career. The above is just a small selection of warnings from Climate Change doom-mongers. 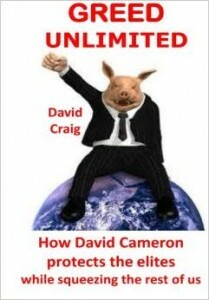 Sir David – will you dare tell the truth? why were most scientists predicting a new Ice Age in the 1970s which would lead to crop failure, starvation and a mass movement of millions of people from the freezing North southwards? why have all the previous predictions of Climate Armageddon been total rubbish? why haven’t the Himalayan glaciers disappeared as was predicted by the IPCC? why was the Arctic not ice-free by the summer of 2013 as was predicted by the IPCC in 2007 – a claim parrotted by loads of politicians? 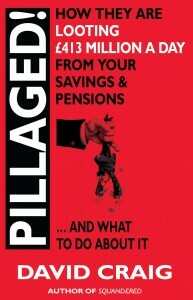 why have the Warmies felt the need to fiddle the figures and falsify the data for decades? will he face up to the fact that the main problem facing mankind is not from the West with its declining population and reducing use of fossil fuels, but from explosive population growth in Africa where the population doubles every 22 years? But Sir David’s programme avoided mentioning any of the above issues. Instead it just produced the usual turgid pile of foul-smelling BBC Warmie propaganda with loads of fancy camera work to frighten the shallow snowflakes who apparently subscribe to the new Man-Made Global Warming religion. Even worse, the programme featured people whose work on climate has been totally and comprehensively discredited, but didn’t feature anyone who was critical of the Man-Made Global Warming group-think. But perhaps the most disturbing part of Sir David’s programme was that the only temperature chart it used (if I remember correctly) was the one starting in 1850 which shows considerable warming. 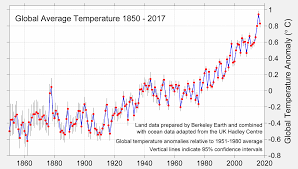 Had Sir David’s programme used the chart of the Earth’s temperature over the last 100,000 years or over the last 415,000 years, we would have seen that today’s warming is just part of a regular cycle and is nothing out of the ordinary. All very odd, don’t you think? 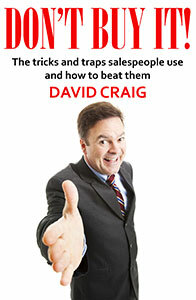 Sir David – I question your objectivity! And I question the BBC’s objectivity! Today I wanted to warn readers about the most serious health threat facing the world. No, it’s not Ebola. And it’s not AIDS. And it’s not a new strain of Bird Flu. It’s not even growing resistance to antibiotics. The greatest health threat to the human population now is Crazy Lefty Syndrome. Crazy Lefty Syndrome seems to mostly affect the young. The vast majority of older people, with experience of life, tend to have some form of immunity to Crazy Lefty Syndrome. 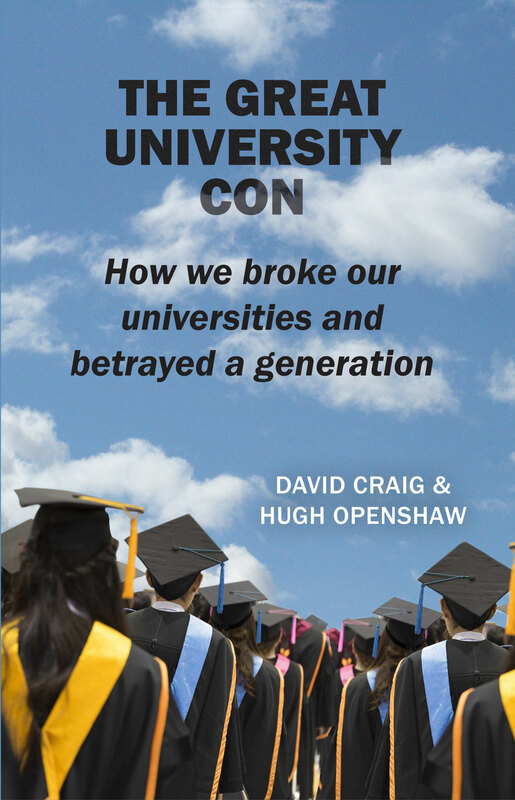 Moreover, you’re much more likely to catch Crazy Lefty Syndrome if you’ve attended one of the Snowflake Indoctrination Centres which used to be called ‘universities’. 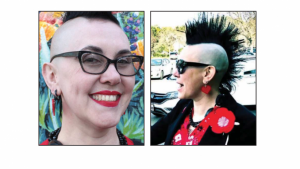 Unless we soon find a cure for Crazy Lefty Syndrome, we could see the complete collapse of Western civilisation and the spread of civil war, pestilence and famine across the countries where Crazy Lefty Syndrome is most prevalent. The short (3 minutes) video below describes the typical symptoms of someone with a serious case of Crazy Lefty Syndrome. The female/thing is called Rebecca Parker Mankey. During the encounter she tried to get the other customers to rise up and force the 74-year-old man out of Starbucks claiming he hated brown people and was “Nazi scum” (an odd insult to hurl at an ageing Jew). She/it left the Starbucks only to return a few minutes later to vent her/its bile at the man again. When people started criticising her for her behaviour, she claimed with the usual Crazy Lefty Syndrome logic “I am right and those attacking me are wrong”. Although this incident took place in the USA, you’ll see many people in the UK also infected by Crazy Lefty Syndrome. In fact, there are hundreds of them bringing chaos to London commuters at the moment. But we’ll discuss that tomorrow. The women, aged 19, 23 and 39, were arrested in Boussy-Saint-Antoine, a small town 19 miles (30km) south-east of Paris, on Thursday night after they were linked to the discovery of a car packed with gas cylinders parked near the cathedral last weekend. It may also be relevant to mention that in 2017, 1,045 of France’s 42,258 churches were vandalised and desecrated. That’s around 20 a week. 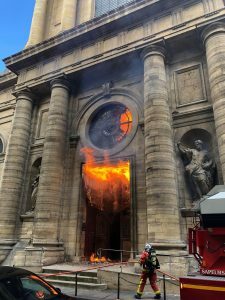 In 2018, the figure was 875 French churches vandalised and desecrated – ‘only’ 17 a week. Oh, sorry. In its extensive reporting of the Notre Dame fire, did the BBC ‘forget’ to mention the daily attacks on French churches? How surprising! These attacks tend to include smashing statues and crosses, breaking stained glass windows, smearing excrement on the walls often in the shape of a cross and the occasional bit of arson. Of course, we don’t know who is responsible for this historically high level of attacks on France’s churches. They clearly have nothing to do with ever-increasing immigration by members of our favourite religion. To suggest that would be racist and inciting hatred. 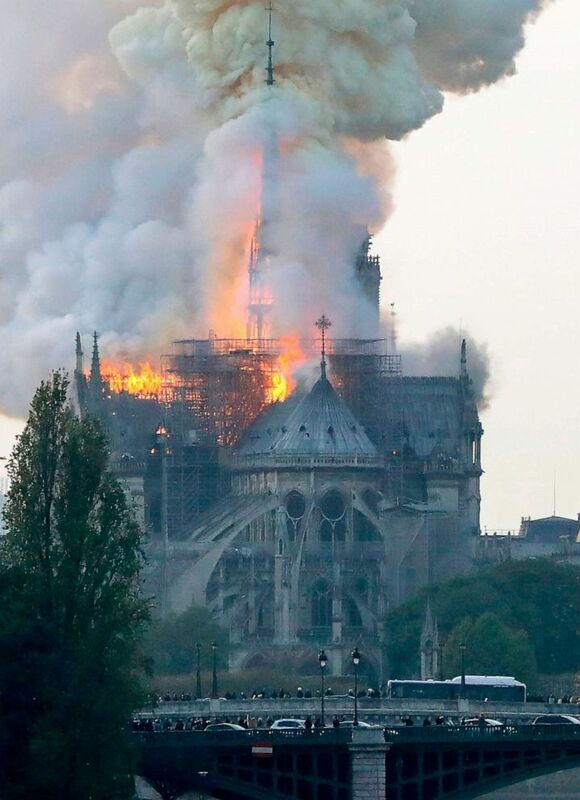 Clearly this fire and the Notre Dame fire are not related in any way. And I assume it would be somehow illegal for me to feature here some ISIS propaganda showing major landmarks in Paris, London and Berlin engulfed in flames? Anyway, if the Notre Dame fire was caused by our friends from the Religion of Wonderfullness, we’re unlikely ever to be told the truth for the usual obvious reasons. I speak Swedish and worked there for a couple of years before the great migrant invasion really began. Back then Sweden was mega-boring. Nothing ever happened. There was almost no crime. If Jon “F**k the Tories” Snow from C4 News had visited Sweden a couple of decades ago, he probably would have complained that he had “never seen so many white people”. If Jon “F**k the Tories” Snow were to visit Sweden now, he wouldn’t have to worry about there being too many white people, especially if he was to visit the largely immigrant Swedish city of Malmö (twinned with Mogadishu). 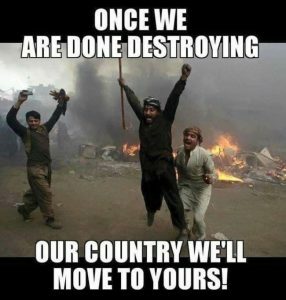 March of 2019 has been the first month in more than three years in which the Swedish southern city of Malmö – a virtual no-go area for police, emergency services and white Swedes – has not had any reported shootings, according to police. Jonas Karlberg, group manager at the investigation section for serious crime in Malmö, commented: “We had an incredible number of shootings in 2016, 2017 and also to some extent in 2018. 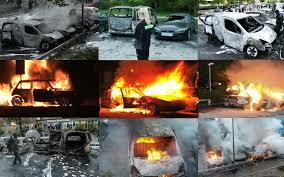 So it is clear that as long as there are no shots fired in Malmö we are incredibly satisfied”. Let me put this into context. The population of Malmö is about 317,000. In comparison, the population of Nottingham is about 316,000 and Coventry is about 326,000. Yet, as far as I know, there isn’t a shooting every month in either Nottingham or Coventry. Luckily for Sweden, the country’s progressive, libtard, virtue-signalling leaders have eagerly signed up to the UN Compact for Safe, Orderly and Regular Migration. So the lull in shootings in once peaceful Malmö may only be temporary. 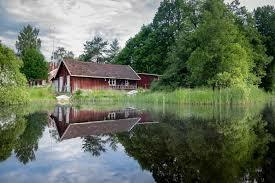 This respite from gun crime did not last beyond the month of March, however, with an incident taking place earlier last week on Wednesday night in the heavily-migrant populated suburb of Rosengård (an area near the centre of Malmö) sometimes referred to as a “no-go zone”.